The YWCA Kitchen is a great place to have a meal near Connaught Place: no messing with dug up roads and after office hours, there is plenty of parking too. The place is small and cozy and has a couple of tables in the charming pocket-sized garden. 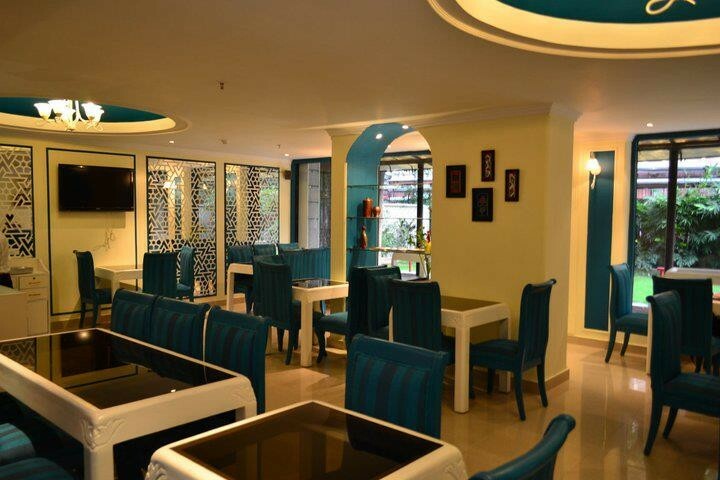 The Mediterranean blue and white eatery serves as the dining room for the adjoining guest house as well as a lunch option for the dozens of offices and banks nearby. Thus, there’s mac and cheese on the menu as well as an Indian lunch buffet to take care of both sides of the equation. The menu travels across the world. So, there are mochar chops (Rs 200 for 6) on one hand and chao tom (Rs 450) or Vietnamese minced prawn on sugarcane sticks. The mochar chops were fat and stuffed to capacity with banana flower chopped and expertly seasoned that you could be forgiven for mistaking them for a non vegetarian dish. However, they are pure vegetarian and absolutely great value for money as well as for taste. Do not miss them. YWCA Kitchen has a sprinkling of Indian food on its menu, but they are some of the best, most intriguing dishes in our cuisine. Tabak Maaz (Rs 250) is the famous Kashmiri wazwan dish of lamb ribs steamed in a fragrant stock and then fried. One of the nicest aspects of this charming little restaurant is its care for vegetarians. Most of the dishes I ordered were vegetarian simply because they seemed more interesting than those on the other side of the divide. Nobody in Delhi serves a mac and cheese (Rs 300) probably because it seems too homely to do so. However YWCA Kitchen is catering to homesick western youngsters and has decided to dish up just those offerings guaranteed to quell longings for home food. There is no flowing sauce in this version and the flavor of the cheese is pronounced. After it has been put under the salamander, the crust is satisfyingly crisp and brown. And like everything else on the menu, the portion size is as large as one could wish. Ema Datsi (Rs 300) is the reproduction of a Bhutanese dish. According to the motherly owner, Utpala Mukherji, whose very presence lifts the experience to the level of dining at a friend’s home, in Bhutan, there are several versions of the dish. Her version has been toned down for the non-Bhutanese diner who is unused to an incendiary level of pungency. So it comes across as a cheese sauce with tiny diced mushrooms and slivers of green chillies in it. Spicy but not unduly so, and interesting. But the bean salad which was the vegetable component of the meal was stupendous. I would visit the restaurant for that alone: blanched green beans with lemon dressing and a generous heap of chopped walnuts. Sungat Diya Misa Maas (Rs 450) is the most unusual dish on this – or any other – menu. Prawns, grated coconut and unheated mustard oil are put in a hollow bamboo and steamed. It could be from anywhere in South East Asia, only the mustard oil defined it as Indian (Assam actually). It is billed as one of the restaurant’s signature dishes. Chikoo Mousse (Rs 120) is light, unusual and not too sweet: a perfect way to end a superior meal.